Console table, having a free form top of Carrara marble, on conforming base with a painted finish showing natural wear, raised on central S-scroll leg decorated with rosettes, raised on bun feet. CONDITION: Very good antique condition. Desirable natural wear to painted finish. Minor chips, scratches to original marble. 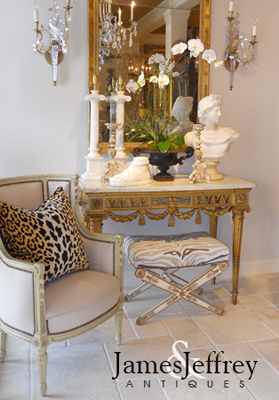 Console table, having a free form top of Carrara marble, on conforming base with a painted finish showing natural wear, raised on central S-scroll leg decorated with rosettes, raised on bun feet. CONDITION: Very good antique condition. Desirable natural wear to painted finish. Minor chips, scratches to original marble.